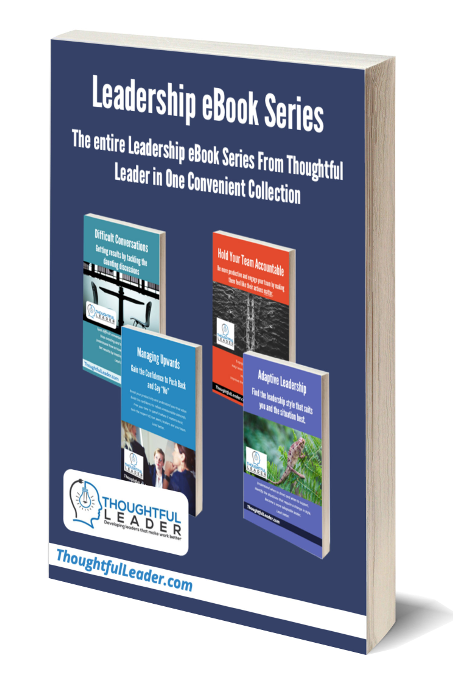 The Leadership eBook Series includes the four popular leadership eBooks from Thoughtful Leader. Hold your team more accountable, improving productivity and building personal ownership within your team. Handle the difficult conversations with ease, to stop small issues becoming large problems. Adapt your leadership style to suit the situation, meaning you’ll be ready to handle what is thrown at you! Have the confidence to push back and say “No” when you need to, to help your team’s and your own wellbeing and productivity. The Leadership eBook Series contains simple, easy to use tools and techniques that you can start applying quickly with your team. The “Managing Up” eBook, which helps you manage up effectively, push back on unreasonable demands and reclaim your, and your team’s time. Managing up is one of the most important leadership skills to master. These four eBooks contain useful, actionable information in an easy to use format. No long text books, just the advice you need, fast. “I got great value out of the Leadership eBook Series. The eBooks cover many useful and important aspects of leadership including leadership styles, having difficult conversations (which I always struggled with) and being able to hold your team more accountable. Click the Buy Now Button Below and Improve Your Leadership Today! 1-hour of personalised online coaching (valued at $220), to help you improve faster.